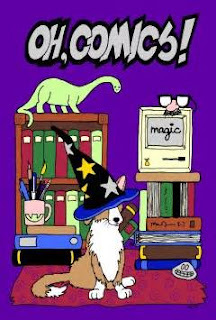 Review: OH, Comics #21, "Magic"
OH, Comics #21, “Magic”, is the 25th anniversary issue of Bob Corby’s great anthology. As you can tell by the numbering, the anthology has been produced almost every year since 1988. 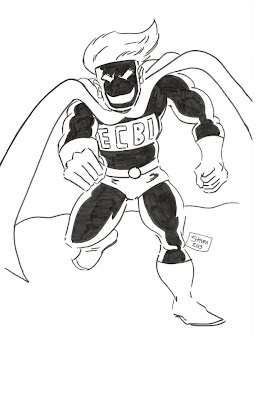 The book began as a collection of mostly-Ohio artists creating strips for a photocopied and hand folded and stapled small press book that was sold at the Mid-Ohio Con in benefit of the March of Dimes. Mid-Ohio con is no longer, and I don’t know of any conventions supporting the March of Dimes anymore, but OH, Comics is still around. It is currently published annually and premieres at Bob Corby’s SPACE Convention every spring. But enough history. On to the reviews! The theme of this year’s issue is Magic, and Max Ink starts us out with a story of his great character Blink with her friends Sam and Hank discussing musicals. The story is called “Oh, the Magic of Musicals” and the group discuss musicals from “Xanadu” to “Singin’ in the Rain” to the immortal “All that Jazz”. The art is wonderful and the conversation is interesting and feels very real. I must however admit I have not seen any of the movies discussed in the story except The Beatles’ “Help” and “Magical Mystery Tour”. The latter of which is probably on the same level as Xanadu. The second story is mine. “The Magic Spear” pits my patriotic hero, the First Lady against a Nazi vampire. Because I couldn’t think of anything more evil than that! Next is “The Box Elder” by Canada Keck. It’s the story of a magical place to read, and I can’t think of anything more magical than reading, so I give Canada the prize for the best on-theme idea in this years’ anthology. It’s a nice, sweet story with cute artwork. “Do You Believe in Magic” by Matt Levin incorporates classical rock lyrics, stamps, and effects to give the reader a nice experience. I can hear the melodies as I read along. Pam Bliss (who also drew the great cover to this issue) contributes “Clarke’s Third Law”. A tale of science, magic, and time travel. Great line art and characterization in this one. Kel Crum tells a Cornelia tale about snarky up-grading people. He does a great job making them very annoying. I think the vast majority of us can relate to this one. 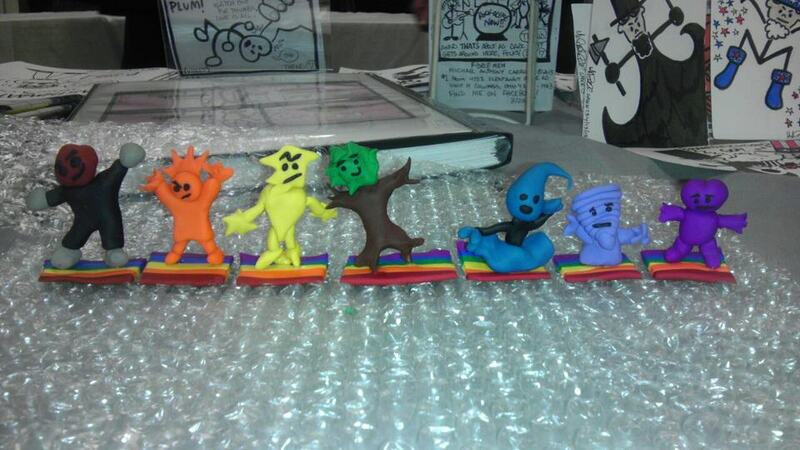 Mike Carroll’s RAINBOW characters tell about their time as Ninjas. Really bad Ninjas as it turns out, but Mike draws great Ninjas and that’s what really matters! There’s a also an evil Wizard in this funny tale so it even fits the theme! Then we have “Onion City” by Sue Olcott involving a cute animal that turns invisible that meets Onion and Radish. Yep, it’s rather odd. But it’s magic! Bob Corby himself anchors the book with a short little tale of Marcel the Penguin performing stage magic. It’s helpful to know something about Bob’s characters to enjoy this. 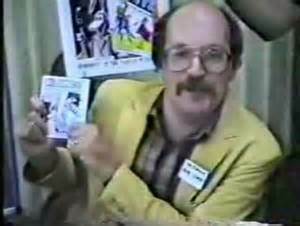 But they’re rather cheap and available from Bob via the same website you can order OH, Comics #21 from! Statues I made of Mike Carroll's R.A.In.B.o.W. Did you know there’s a “lost episode” of the award-winning webseries Out With Dad? Seriously, it is absolutely true! I am certain I remember creator/writer Jason Leaver discussing the episode in an interview or commentary sometime in the past, though I do not remember exactly where or when. But I do know it to be true. I know this because Jason asked me to adapt the script for the “lost episode” into a comic. Yes! I have the pleasure of creating what is, to my knowledge, the first official Out With Dad product outside of the webseries. I think I’ll take some time to give a little information about the project, but not too much. I really don’t want to spoil it before the official release! So what I will say is this: The events in the comic take place during season 2 of Out With Dad. The comic runs 10 pages. I do not know the release date. When adapting the story I have made sure not to change any of the dialogue from the script. Finally, I will have a flier promoting the comic available at my table at the SPACE convention in Columbus this weekend, along with a little of the art available for viewing (without too many spoilers!). And one more thing, I would like to publicly thank Jason for allowing me the opportunity to do this. I just can’t put into words how thrilled I am to be working on this project! I just finished putting together F.E.D.s #17, the final issue of vol. 1 of the F.E.D.s. It will be available at the SPACE Convention this weekend (April 13 & 14) or it can be ordered via mail (e-mail me at Fedscomic@yahoo.com). This story resolves some plot threads that have been lingering since the early issues and leaves a lot to be resolved for volume 2. Hopefully, the ending is quite the surprise, also! And here are my thoughts on the rest of the 2013 SPACE Anthology. Cosmos by Seth by Christina Wald is a take on a reboot of the classic science series Cosmos. I am a huge fan of Cosmos! In Fact, I’m currently reading the companion book to the TV series. Christina looks at the possible reboot apparently being done my Neil Degrasse Tyson and Seth MacFarland. There are some interesting bits in this two-page strip. And anything Cosmos gets a thumbs up from me! Bamn Rob's Adventure by Troy-Jeffrey Allen & Jay Payne is a very well written story of a teenager selling a prized gaming card while wearing a Viking outfit. I really like this story, and it didn’t grab me initially. Well done! One Scoop of Justice: Mystery of the Mailbox Monster! by Mark Mariano is a mystery about a stamp collector who is also a kidnapper. This strip features plenty of outrageous characters and is great fun! Lament's Dawn by R.J. Paré & Danny Kelly is a take on Middle-Earth type creatures on the American continent. It has a very neat artistic style. Tecumseh in the Ohio Territory by Lee Smith is a cartoon retelling of the history of the great chief Tecumseh. This is a great comic for a classroom! Three Years by Chris Charlton & David Hollenbach is a sad tale with very painterly art about a survivor of the apocalypse. It’s very moody and has a neat ending. Mutant Elf in Shop 'til You Drop by Steve Myers is my strip. I hope you like it! Welcome to Fair at New Boston by Rachel Altvater Is the story of a packer. You just have to read it to understand. The Last Meow by Lorenzo Ross is about a guy working for a business that sells cat items. The business isn’t very well run, which causes problems for the narrator. Robbery at Key Foods Redhead by R Hendricks is about two people who meet during a robbery. And that’s it! 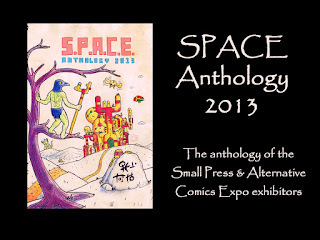 All the neat comics in the SPACE Anthology 2013! I hope you check them all out and if you like it maybe buy a print copy. For more information about the creators check out the links listed in the SPACE Anthology or the creator list on the Back Porch Comics SPACE page. I’ve been rather busy preparing stuff for the upcoming conventions I’ll be attending, so I haven’t posted anything new here in over a week. 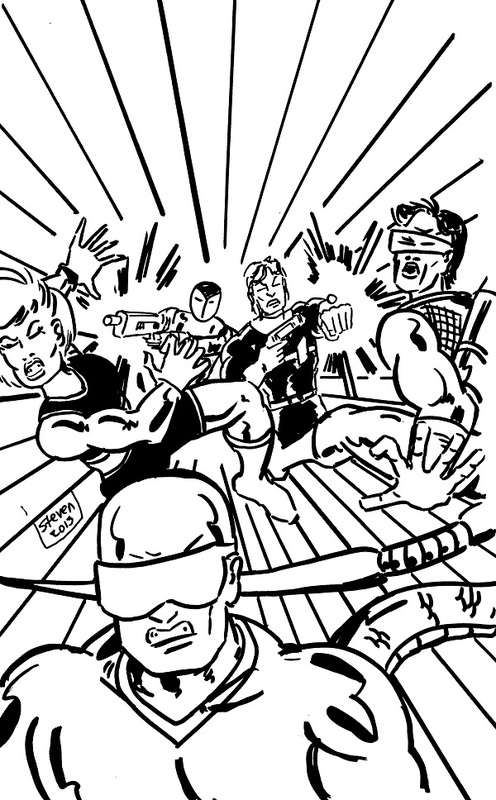 However, that now changes with this review of the strips in this year’s SPACE Anthology. The SPACE anthology is a collection of comics done by creators who will be attending this year’s SPACE convention in Columbus April 13-14. The anthology is available for free from the SPACE website and also available in print at the con itself! How'd He Do That by Matt Chic is a story about a group of costumed heroes who don’t have any powers, except perhaps those that involve urination. The strip has neat, goofy art and is very easy to follow. It’s short but cute. Geography in a Glass by Kyle Smith & Sarah Morton is a history lesson about the manufacture of beer. I’m not a drinker and I don’t usually read such history, but I’m not going to bash the strip because of my proclivities. It’s rather interesting I’d say, and well done. It isn’t a typical comic, but the best part of reading independent creators’ works is reading atypical strips. Second Chance by Jason Walz is the story of a guy named Doug. It summarizes the humdrum life he has experienced and then provides a twist. I really like the black and white art in this one. It’s very clear and the character expressions are great. The Secret Origin of Cap'n Catnip by Tim Fuller is a nice talking animal strip with very good color art. The art reminds me of Disney comics, though the story is a bit more mature. The Charles Atlas spoof is well done. Thoughts of a Hitler Cat by Kel Crum is a one page strip about a cat that resembles Adolf Hitler. Poor cat. Kel’s stuff is always quirky and fun. Death by Michael Eshelman & Doug Hufford is a humor strip about Death. Simple but fun, and another strip with a fun twist! Silent Call by Brian John Mitchell is, I think, photographs of paintings. Or some neat program that duplicates such. It’s about Cthuhlu. I think. It’s visually very interesting and kept me looking at it for minutes. Roadside Attraction by ED is about a UFO. I like the color technique here, it has an old-school look. It’s about two guys who see a UFO. With a twist! Crimes Against Creation by Shawn Padraic Murphy & Crystal Ash page is about a man who goes on cosmic trial for not doing anything with his life. It’s a neat idea with lots of funny philosophy and theology. The Inquiring Minds in One Day on Moonstone Mountain by John Steventon is about a group of Bigfoot hunters. I like the cartoony art and the twist at the end! Once Upon A Platypus: Morning Routine! by Ron Braun. A platypus trying to copy a human’s morning routine. A funny strip with lots of humorous bits. Okay, that’s about half the strips. I’ll continue with more in a few days!